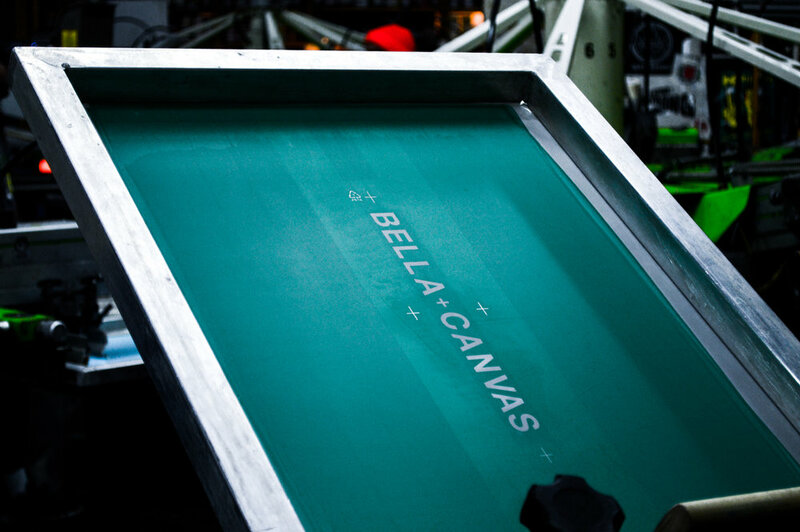 This past February we invited Bella+Canvas over to the shop to shoot a how-to video on screen printing and heat pressing vinyl designs on fitness leggings. 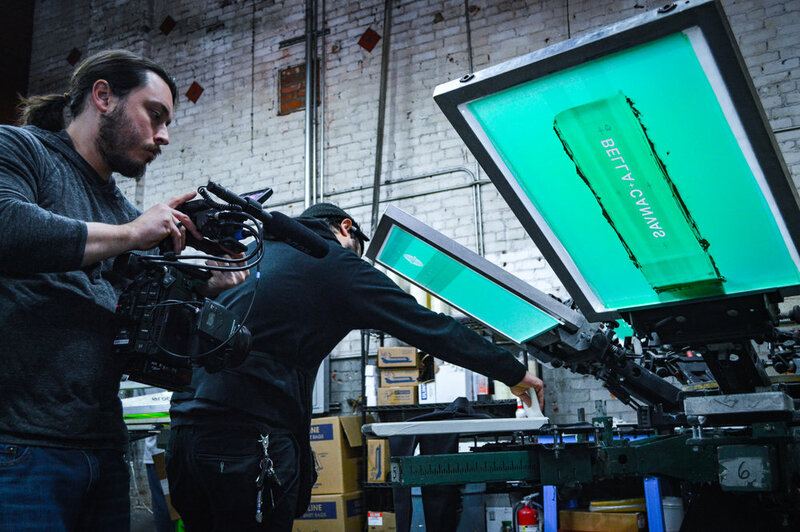 Our Production Manager, Mike hit the manual screen press while Phil, our in-house jack-of-all-trades, hopped on the heat press. 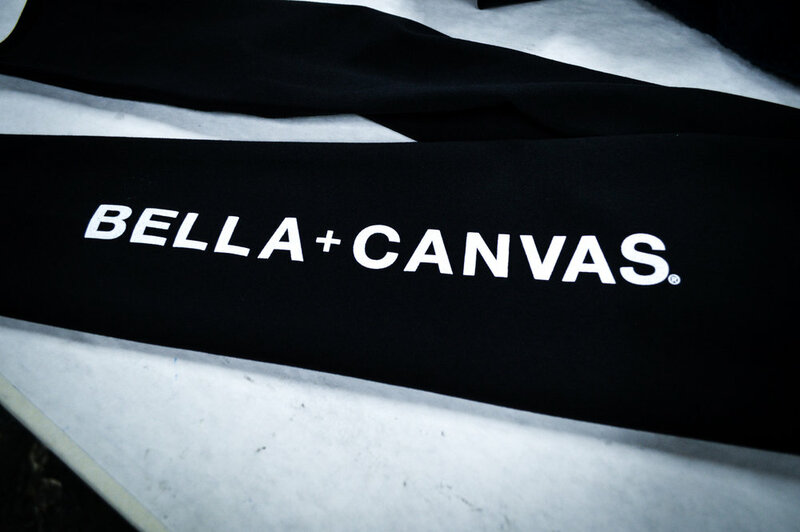 Getting the opportunity to work on a video with Bella+Canvas was an incredible experience, and it’s always fun for us to help others learn a little more about our craft. CHECK OUT THE VIDEO & BEHIND THE SCENES PHOTOS BELOW! As some of you may know, we’ve been hard at work on planning and building a brand new facility. 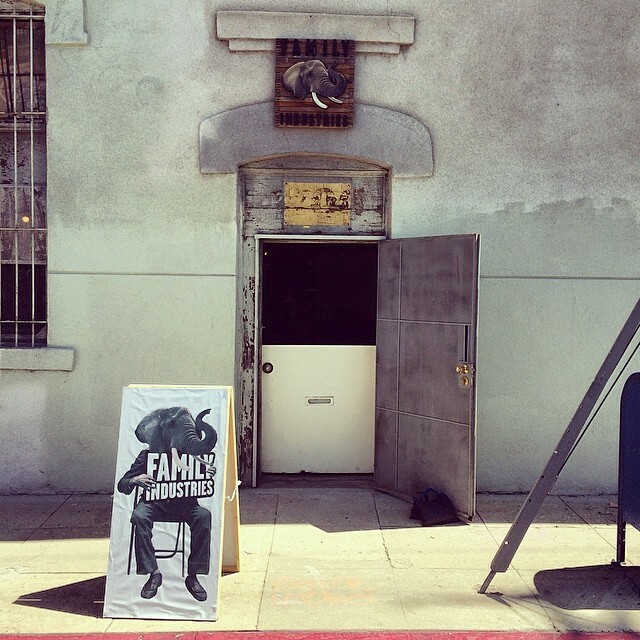 Well, we’d like to formally introduce you to Camp Family; our brand new facility in Frogtown, Los Angeles, CA! We know, we know… the place is a bit of a mess right now. We actually have a very good explanation for this beautiful mess. As of Monday, March 11 we’ve officially broken ground on Camp Family’s construction! We are giddy as hell to finally get started on building our new home, but there’s still a ways to go. In our continued effort to bring you beyond our walls and inside the Family, we are going to periodically share photos of Camp Family’s progress. 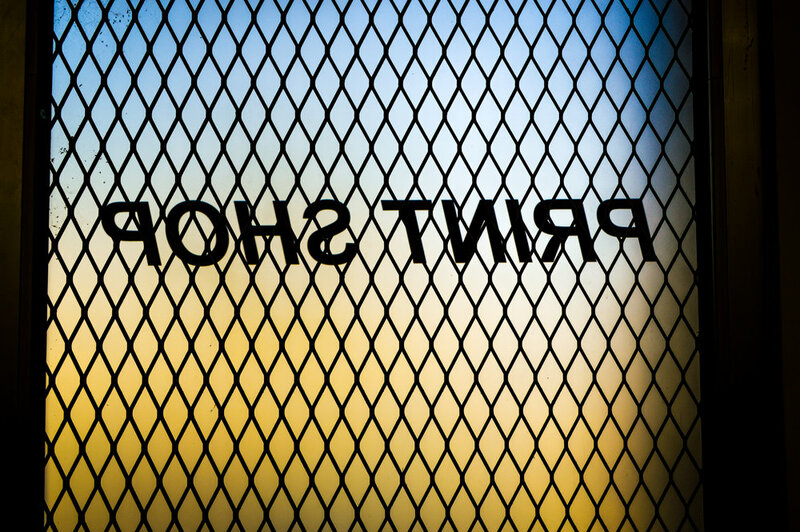 Take a trip through Family Industries past. Back carriage house in L.A. rented by Alex & Max in 2008. Alex & Max: Making it happen. Max (left) and Alex (right) in the first warehouse space they rented in L.A. 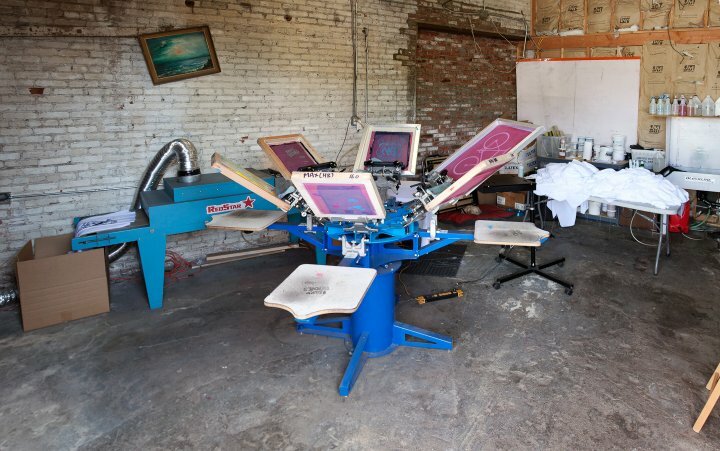 The very first high-quality, multi-screen printing press we ever owned. Before Family Industries, Max screen printed for various musicians he was working with at the time. 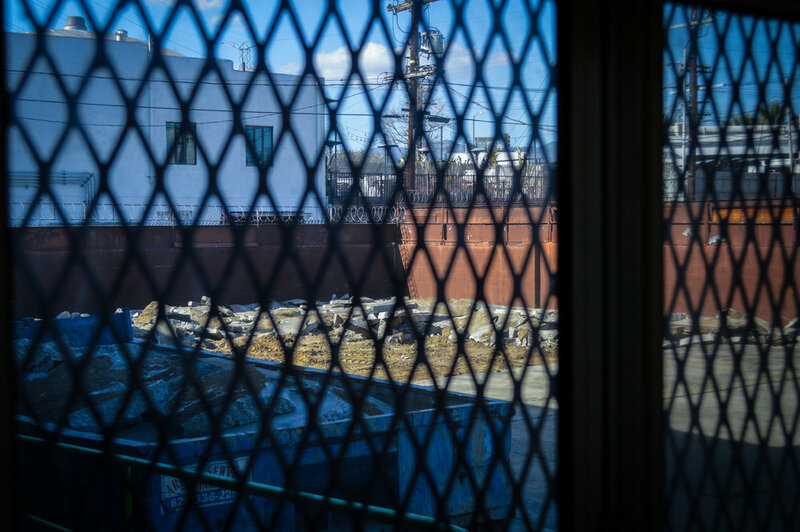 The final day in our original warehouse. The Family Room before the painting and pressing began. Progress photo of our name being painted on the warehouse wall. Progress photo of our original logo being painted on one of our warehouse walls. When we moved into the Family Room a lot of work needed to be done. First and foremost, a place to go to the bathroom. One of the first iterations of the Family Industries logo. Max (left) and Alex (right) taking a break from the paint fumes with Alex’s dog Ace. Before the street art and the tagging: the Family Industries front entrance. 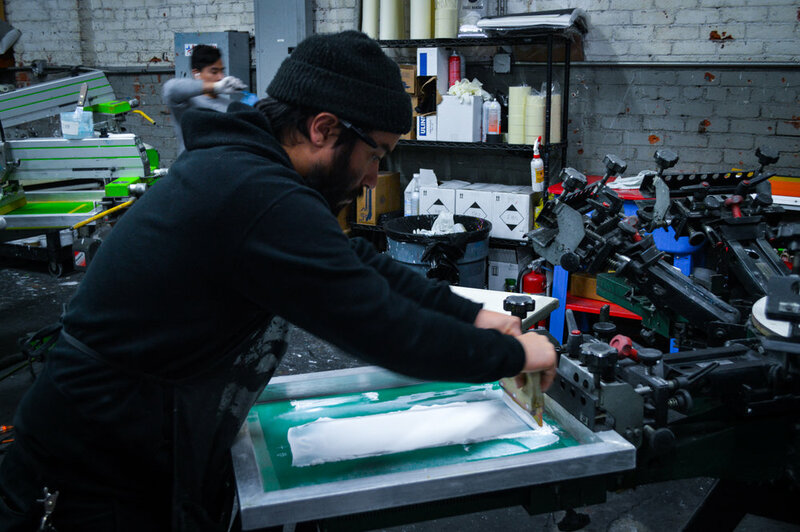 We recently teamed up with our friends at AMOEBA MUSIC (the world's best record store) during a recent run of their merch to show you how we do things here at Family Industries! 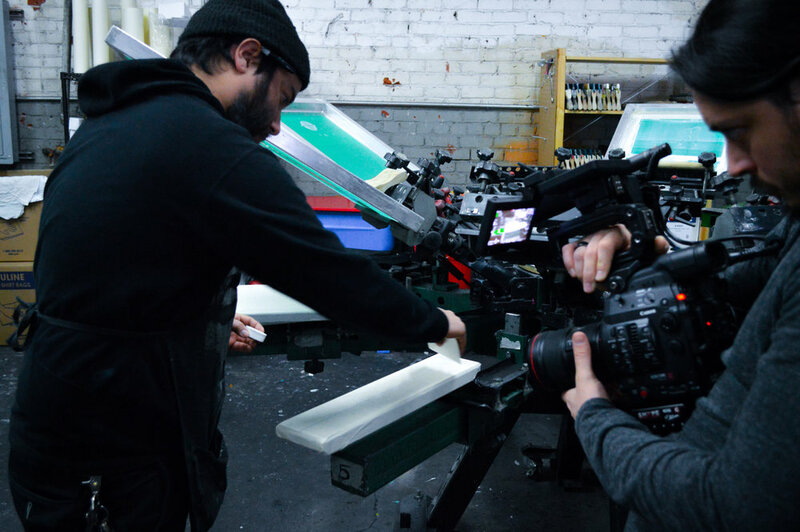 Get a peek behind the scenes at Family Industries to see the steps in the t-shirt production process from start to finish!